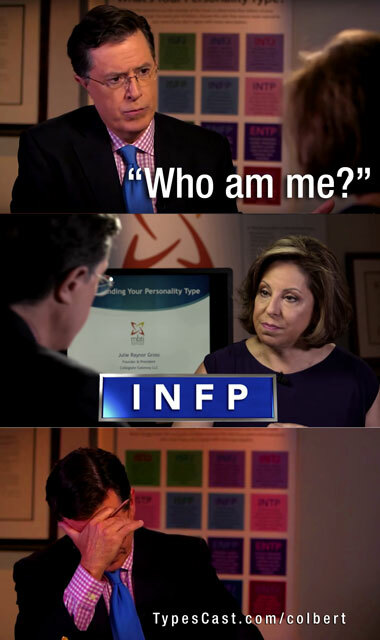 Recently on The Late Show, Stephen Colbert took an MBTI (Myers-Briggs) “personality test”, and his “results” were INFP. In his typically skeptical manor, he frankly did not seem convinced—and he shouldn’t be! You cannot rely on a test alone to understand your true nature, and the MBTI “professionals” who would lead you to believe that their test can do this should absolutely NOT be giving people that mistaken impression! Is INFP even likely to even be Stephen’s true nature?? An INFP is a sub-type of N-Fs, whose main focus is on theirs and other peoples’ emotional well-being. Is this *really* what motivates Stephen when he gets out of bed in the morning? One thing’s for sure—answering a few questions on a sheet of paper, with virtually no familiarity with the topic is no way to definitively determine something as crucially important as one’s true nature! We want to hear from you! Let us know what you think on the topic by leaving a comment below! TypesCast.com | Over 500 celebrity typecastings and counting! Curious if we’ve TypeSpotted someone? Search in the box below, then click the ‘Image’ tab and click to view any results that appear!